Introducing Homebrewing Beer: The Beginner's Guide from Dogwood Apps! Homebrewing has proven to be an excellent hobby for millions of people around the world, most of whom create excellent sudsy beverages that taste better than many of the mass produced beer that you will find on your supermarket shelves. If you have friends that are interested in beer, homebrewing can be a great bonding experience. Often times it is easier to have more than one person involved in the beer making process, and having someone to share the massive batches with means that you will have a reason to brew your next batch sooner rather than later! Cost wise, homebrewing your beer can also be a big money saver. Sure, you are going to have an upfront cost, but you will be able to make two cases of high quality beer for roughly $30. Compare this with micro brews that cost roughly $9-$10 for a six pack and you will quickly see the results. Is it easy to homebrew? Absolutely! Making Beer is actually really easy. Beer contains just three ingredients: Hops, Barley, and Water. However, making good beer isn't as simple as throwing some hops in with Fruit Loops and water and letting it sit. There are certain steps that must be taken in order to ensure that your batch of beer comes out just the way you would expect it to. This book will help guide you through this process in the simplest terms. 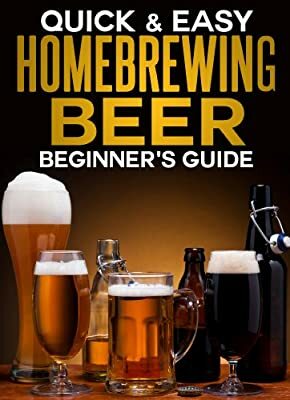 What does your Homebrewing Guide offer compared to other books on Amazon? We walk you through step by step how to brew your very own first beer.......a chocolate barley stout! We cover alll the basic ingredients for this recipe and hand hold you through the entire brewing process. Does this book offer other recipes once we learn how to brew? Please don't forget to leave us a review! Check out our other books as well in the Quick and Easy Series!